Reading while you knit is a useful technique that can save you time and even improve your knitting speed. The key to developing the technique is practice, but here are some tips that will help you along. It’s essential that you feel comfortable with your knitting technique, and can easily create a well-tensioned knitted fabric before you try to knit without looking. It may also help to spend a few minutes knitting while watching your hands, just to warm up and get used to the motion and feel of the yarn and needles. If you keep sneaking looks at your knitting without meaning to, practice knitting in a dark room for a while. You’ll begin to realise that you get used to the “feel” of the stitches, how they’re lying on the needles, and can differentiate easily between knit and purl stitches. It’s really essential that you find somewhere to rest your book that is tilted at a 45 degree angle, and that you’re sitting comfortably, and not hunched over the book in an awkward way, trying to keep it open. You could invest in a good book stand that keeps your book open, or read books that lay open easily. I’ve often found elastic bands useful for keeping pages spread out too. Alternatively, you can read articles or ebooks on your computer or ebook reader; although some people find them tiring on the eyes, you don’t need to worry about propping them open. 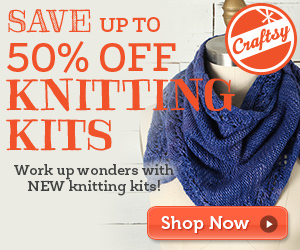 Try to develop a rhythm between your knitting and your reading. You’ll need to look down occasionally to make sure you haven’t made any mistakes. If you do this when you reach a paragraph or page-break, it will be easier for you to find where you left off reading, and you won’t spend a lot of time reading and re-reading the same sentence. It’s unrealistic to think you’ll be able to knit a complicated lace or cable pattern without looking down at your knitting. Such patterns require not only your visual, but also your mental attention, and you’ll only cause yourself grief if you try to read at the same time. Long stretches of stocking stitch, garter stitch, ribbing, or other simple knit-purl patterns are best for knitting while you read. Knitting in the round on circular needles is perfect because you don’t have the interruption of turning a row to take your eyes off your reading. 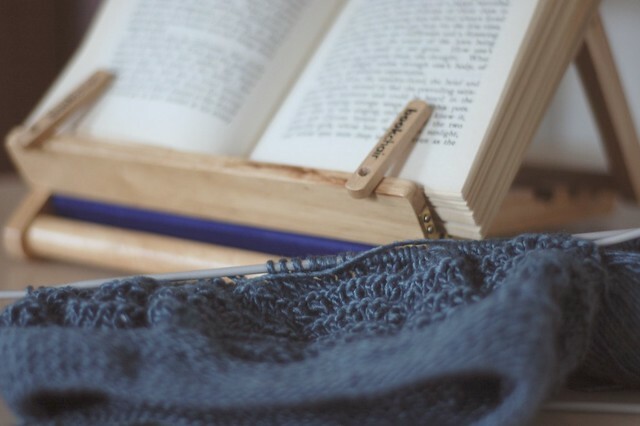 Practice, and soon you’ll have the added benefit of doing something productive with your hands while you read, and learning something interesting while you knit and relax. Enjoy! P.S. In case you’re wondering, I’m using a standard size Bookchair in the photo above. You can obtain these from Amazon US or Amazon UK .